Built to Broom's exacting standards. Hand laid GRP planing hull and superstructure and just enough teak deck to make her feel luxurious without excessive maintenance. Satin finished teak interior with teak and holly laid flooring. New interior carpets 2017 and recent upholstery in the saloon and dinette (the forward cabin has barely been used and is always kept covered). Aft cabin is ensuite with separate electric heads (starboard) and Mira shower (port). The 415 OS is a full planing hull for fast offshore cruising. Reviewers have extolled her excellent sea keeping abilities even in heavy weather but with a command bridge and fold-down arch she'll also access further inland than a comparable sized flybridge cruiser. This particular example benefits from having fastidious and knowledgable owner who has maintained her regardless of cost throughout. Although she was well spec'd at build and has the favoured Yanmar 420hp engines she has been upgraded since with the addition of a Fischer Panda generator and PSS shaft seals. The helm and navigation area is well laid out, everything is to hand and the helm has good clear vision whether planing or berthing. The aft deck with step through transom access is about as versatile as you get with comfortable seating, a good sized dining table and ample storage beneath. 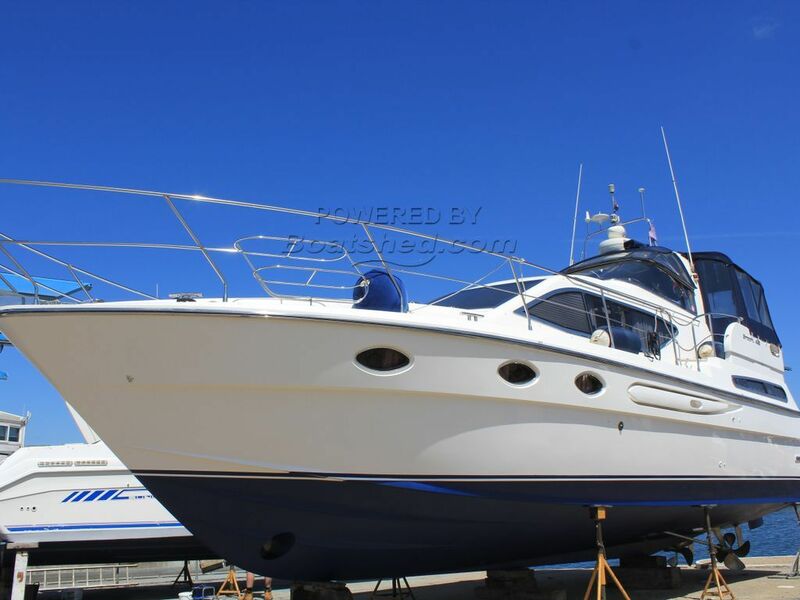 The interior feels light and spacious but at the same time comfortable, the satin teak finish with the light upholstery works beautifully to me in the saloon and dinette and the aft cabin with separate shower and heads areas is vast for a boat this size. This Broom 415 Offshore has been personally photographed and viewed by Corinne Gillard of Boatshed IOW. Click here for contact details.